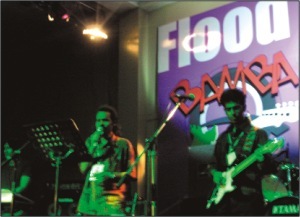 It was the first day of the two-day concert of Bangladesh Musical Bands' Association (BAMBA), for raising funds for the rehabilitation of the flood ravaged people of the country. Popular names of the country's contemporary rock talents came together with the big names like Nagar Baul and Warfaze to bring Dhaka one of its biggest and best taste of rock and metal music in recent times. The performing bands on August 19 were The Trap, Vikings, Dalchhut, Feedback, Warfaze, Black and Nagar Baul. The warm-up session was well performed by The Trap with six of their songs. The upcoming band started with Matir deho and ended up with Nodi. The second to go on stage was Vikings who also sang six songs including Bon Jovi's hit number Its my life. Viking's Jibon, Tumi kotha dao and other songs were also enthralling. Dalchhut, one of the most cherished bands of the evening, then performed nine songs. Bappa took the floor first and sang Bristi porey, Aaj tomar mon kharap meye, Chander shohorey, Jorer ghorey and Tumi aamar bayanno taash. Sanjeeb came up amid a loud ovation from the audience and started with his latest hit Tomar bhaj kholo and carried on with songs like Rangeela, Gari choleyna and others. Then came Feedback with its newly-picked vocal Lumin. The promising singer sang Feedback's all-time hit tracks like Moushumi, Melay jaire. The crowd went wild as usually during Melay jaire. The eight songs of Warfaze, another main attraction of the show, drove the crowd to a frenzied state. Their Boshey achhi eka was especially enjoyed by the heavy metal fans. The band also rendered Ei shomoy, Obak bhalobasha, Ekti chheley, Joto durey thako, Hey moharaj. With Balam's extraordinary vocal, their overall performance was definitely the highlight of the evening. Then the alternative band Black came up on stage and began with Toni's drum session. John and Tahsan sang some of their popular compositions including Abhiman, Eki rokom, Smriti, and Prakritik. But the pinnacle was the duet song Mittha by John and Elita--the only female performer of the concert. Elita's soft voice put a new spin to the evening, no doubt! Finally, James with his band Nagar Baul began with the song Jotodin achhey dehey pran. James' hit numbers like Didimoni, Ekjon bibagi, Ei chokhey takiyona, Goponey and Hoi hoi kando and others turned the crowd just mad. The sound, lighting, security arrangements, audience management and the band line-up were perfect. No untoward incident marred the show. But the crowd turn-over did not seem satisfactory. 'If BAMBA had split the price to Tk. 250.00 per show, more audience would have come to this concert,' said many music lovers at the event.